Ayecon (that’s pronounced Icon) has long been hailed as one of the most amazing, most complete themes available for jailbroken iOS devices. Today, Surenix, the designer behind that theme, has released the iOS 7-inspired Ayeris (pronounced Iris). The theme features colorful app icons, redesigned interface elements, and more. Keep reading for a full breakdown of what the theme includes and even more screenshots of it in action. At release, Ayeris supports over 150 apps with more to be added in future updates. A complete list of supported apps can be found on Surenix’s website. The Ayeris icons are very well-done, as is to be expected. The Apple Store icon looks like the aluminum side of a physical Apple Store. The Messages icon takes on the appearance of its OS X counterpart. The Settings icon gains more depth between the gears. The Pages icon more closely resembles the Mac version, but adapted to fit within the shape of an iOS icon. Many of the icons are more detailed than the stock versions while maintaining an overall feel that fits with the un-themed icons. Some of the Ayeris icons even bring a more unified design to certain icons than iOS 7’s redesign. A perfect example of this is the entire collection of Facebook apps. 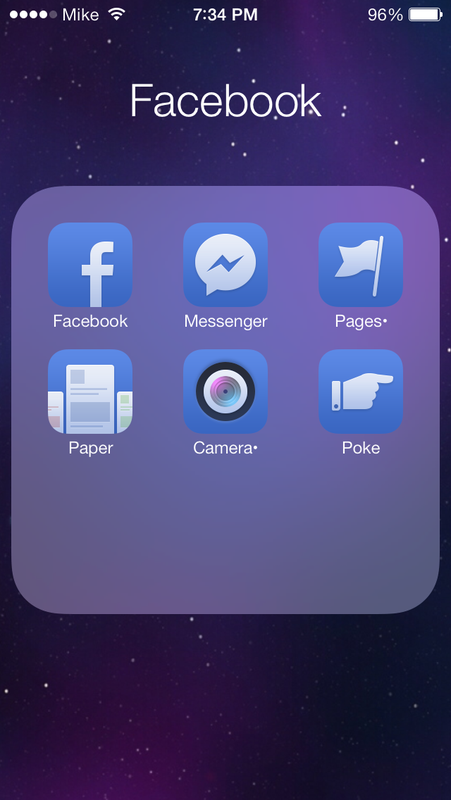 While some of the current Facebook apps share common colors, others (like Messenger) don’t fit at all. Ayeris unifies the entire line—even the abandoned Poke app—with a common color scheme and design. While I like what Surenix has done with most of the icons, there are a few I just wasn’t feeling. For example, the colors in the maps icon don’t really make me think of a map. It feels as disconnected from the actual use of the software as the stock Game Center icon. Three other icons that bugged me were Camera, Photos, and Videos. Camera’s icon is not bad by design, it just doesn’t really bring a camera to mind and sometimes throws me off, leading me to think it’s Photos. The Photos icon, on the other hand, is the most colorful of the bunch. It’s not that I think it’s a bad icon, I’m just not sure it fits in with the rest of the theme. Finally, my biggest peeve with the Videos icon is that it’s so easy to confuse with the Remote icon. I would have prefered to see something a little more reminiscent of movies or TV, which is the primary type of content you’ll find in the app, rather than a play button that could represent any media application. Many of the system icons have also been revamped. These include common buttons like the share button, back and forward arrows, status bar icons, compose button, and tab bar icons. From the App Store to Safari to Mail, you’ll notice little touches and tweaks that makes the interface more enjoyable. Sharp corners on previously-square icons have been rounded out (see the share and update buttons above), the tab button in Safari has been redesigned to match the tab-switching interface, and the location icon in the status bar and elsewhere has been changed to resemble a location marker like you might see in a mapping application. Oddly, these changes don’t carry over to some apps, like the iTunes Store. The sharp corners in the Photos app’s tab bar have also not been rounded, but that makes some sense since photos don’t have rounded corners. In the status bar, the signal indicator dots have been made a little smaller and the Wi-Fi signal bars have been thinned a bit. Other tweaks include new mail account and mailbox icons. Surenix has put a lot of thought into refining the iOS 7 design, from improving the app icons to softening blocky glyphs system-wide. Aside from a few icons that perhaps don’t work as well as they could, it’s a solid improvement on the existing design. You can grab Ayeris today on the BigBoss Cydia repo for $3.99. Future updates with new icons and other enhancements are expected to be free for existing owners. If you’re not seeing the theme yet, try refreshing in a few minutes, as the Cydia repos do not always update on a set schedule.